Iasos (pronounced ya' sos) is one of the two original founders of "New Age" music, and specializes in celestial and inter-dimensional music. 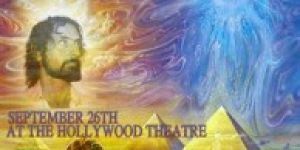 On September 26, Iasos presents a very special multi-media concert of other-worldly music and visuals at the Hollywood Theatre. Iasos will be performing on six of his magical instruments and the music will be enhanced by heavenly visuals that are tightly-synchronized with the music. Special guest Prism Band will also perform.